Add the item to purchase in your cart. Go to your cart and click Checkout Button. Enter the details and choose the payment option. Sit back and relax and let SMEshops work for you. Are their any delivery charges? Yes. For orders below Rs. 1000 we charge a delivery fee of Rs. 150. However for orders above Rs.1000 there is no delivery fee. How can I pay for SMEshops purchase? We at SMEshops provide multiple payment options to facilitate our customers. You can choose Prepaid or COD option. These options will be available during the checkout. Does SMEshops sell the products? 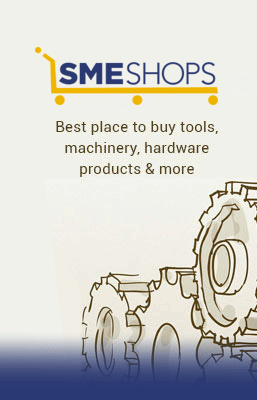 SMEshops is a marketplace, hence we help the customers and suppliers with a platform to fulfill each other's demands. All the products listed on our website are sold by our supplying partners. Once your Order is successfully placed, you will receive a confirmation over email and text message from SMEshops. This mail will have all the details related to your order. Order details can also be viewed at My Account > Order, if you have placed the order through your Login ID. Yes we accept bulk orders, please place an order and we will call you on the number provided by you. Net Banking 5-7 business days. Debit Card 5-7 business days. Credit Card 7-21 business days. How can I place an order if I want to purchase an item with C Form? Fortunately for our customer we do allow purchases with C Forms but you will have to pay the full tax and provide us with the C Form acknowledgement and once you receive the C Form you need to submit it to us and we will refund you the balance tax amount instantaneously. How an order is fulfilled? Your order would be delivered through reputed courier companies at your doorstep. Bulk Orders (greater than 10) & heavy items are shipped through surface & may take 7-8 days for delivery. We always ensure that our delivery partner calls you to inform you about the delivery time. Standard delivery time is 5-7 days, however for some products delivery time may vary depending upon the stock availability or depending upon the size of the order. Why is standard delivery time different for some products? Once your order is confirmed and processed, you will receive a shipment notification via E-mail/SMS advising you on the estimated date of delivery. Due to unforeseen circumstances, it is possible that your order might get delayed. We will send you an E-mail/SMS informing you about the delay along with the new expected delivery date. Shipping refers to packing and dispatching of your order. While placing an order, you will find a shipping timeline on the products displayed on the website (e.g. dispatched within 5 days). This refers to the number of working days it will take to dispatch the product from our end. The delivery may take 1-3 days depending on the address specified for the order after dispatch. SMEshops believes in making your shopping experience perfect. However, if you receive an open or a tampered package, please do not accept it. Report this concern and we will look at it immediately and get back to you. The status on the tracking website shows delivery was attempted but I was not there to receive. Is it possible to get the delivery now? Yes we do offer replacement under the below mentioned conditions. In case the seal or shield has been removed we will not accept any returns. How should I inform SMEshops about the return of damaged product? Can SMEshops cancel my order? Product no longer available or temporarily out of stock. How long will it take get back the refunded amount? We take anywhere between 3-4 days to complete your refund request. For all pre-paid orders, the refund amount will be credited to the same account from where payment was made. For all Cash on Delivery orders, refunds can be in the form of an NEFT transfer to your bank account. What is the relation in between Power2SME, BEBB India and SMEShops? Power2SME Pvt. Ltd. was formerly known as BEBB India Pvt Ltd. Power2SME Pvt. Ltd. is the parent company for two units - SMEShops and Power2SME. Power2SME is the largest buying club for all SME’s across India for Raw material like Steel and Polymers, SMEshops is a one stop solution for all types of finished industrial goods and products.